It’s Sunday night and I’m looking forward to what I’m going to cook this week! Since the temperatures have dropped and look like they’re officially going to stay there, I’m looking forward to make some winter-y meals. Chopped Apple Salad with Toasted Walnuts, Blue Cheese and Pomegranate Vinaigrette: I made this for book club a few weeks ago, and although I generally feel that cold lettuce leaves do not make a meal, I really liked the rich flavors in this salad. It helped to make the dressing from scratch (although I eliminated the pomegranate) – can’t go wrong when you do that. And of course, I added plenty of extra blue cheese! Quick and Easy Tofu with Ramen Noodles: I like this method of cooking tofu (searing it without the trouble of pressing and marinating it beforehand), and of course I’m going to love anything with noodles. Hey, my half-marathon might be over, but I’m still going to carb-load. How else will I stay warm in winter?! Red Quinoa Salad with Spicy Lime Vinaigrette: I love lime, I love spicy food, and I love quinoa. This salad looks like it has some great cold weather ingredients (pumpkin, etc.) and some unique flavor combinations. 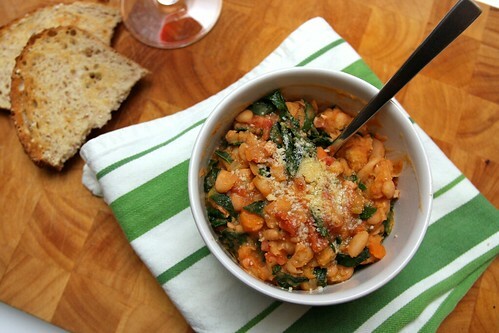 Tuscan Ribollita: Shutterbean is one of my favorite food blogs. It’s the first one I started reading with any regularity, and the recipes that she posts are realistic yet comforting and gorgeous all at the same time. I think N and I made this Ribollita soup recipe a few years ago – when we didn’t have a big soup pot so we had to make the recipe in two small saucepans. I now have a huge soup pot and look forward to making this rich, almost stew-like soup again. Yummy Italian flavors, served warm, with a big hunk of bread and hearty, healthy ingredients? Can’t go wrong. What are you making as the weather changes? This entry was posted in Food and tagged autumn, book club, comfort food, food, GENK, list, recipe, vegetarian, winter by Katy. Bookmark the permalink. I also love Tracy’s/Shutterbean’s website… so fun to browse her photos and stories. I am hoping to make lots of roasted veggies, more homemade bread recipes, and hot cider!